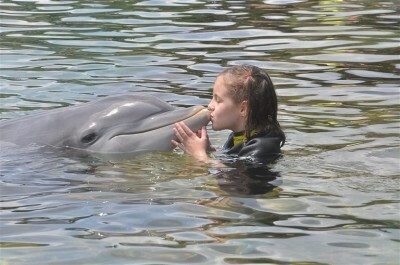 Ever since I was younger, I have always had a love for dolphins. Their grace in the water and appearance has made them one of my favourite animals. 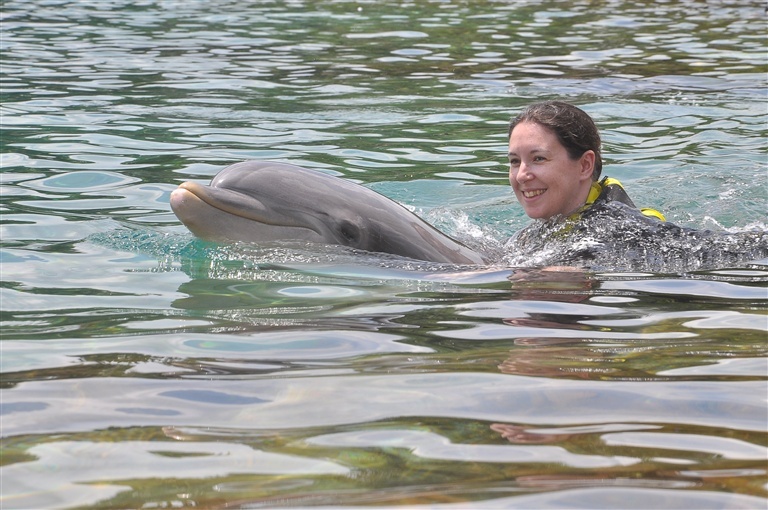 I have always wanted to swim with dolphins, but realistically I didn’t think I ever would mainly because I’m not overly confident in really deep water. 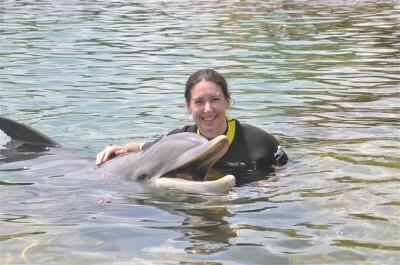 When we booked our holiday to Disney, we enquired about swimming with dolphins at Discovery Cove. With the dream a little closer, I knew this was going to be a once in a lifetime experience and I had to push all fears about water to the back of my mind. Discovery Cove works as an all-inclusive day trip package with the optional extra for a dolphin swim experience. The prices worked out at approx $259 per person, and Miss A was classed as an adult price. It’s not cheap, but you’re paying for the experience as well as the facilities. For that price we received our all-inclusive day which included all food, drinks, snacks, towels, wetsuits and use of all the facilities in the park. We were advised to arrive early as the park opens at 8am and check in starts from 7.15am. Dolphin swims are allocated on a first come first serve basis at check in, so to avoid a late afternoon swim, or risk being stuck in the afternoon storms, we arrived at 8am. The queue was already quite long but moved quickly. We were allocated a 12.05pm swim, which turned out to be perfect for us. By the time we had walked through to find a locker, enjoyed a really luxurious breakfast and changed into our swimwear, we were able to enjoy time exploring the park without rushing before our swim. It was soon time to make our way to the briefing area where the safety talk was given. We were in a group with another family, making a total of 9 of us altogether for one dolphin and two trainers. Miss A had the option of wearing a life jacket to do the actual swim, but stayed without it to start with so she could stand in the cove without bobbing off the bottom of the surface. The cove was cold! We were told about this as we were of course entering dolphin territory. The surface was also very slippery and it took us by surprise a little as we walked down the slope. There were a few almost slips, but the floor was better when it levelled out. For me this was just over waist height and Miss A was in to her chest, but still comfortable to stand in. 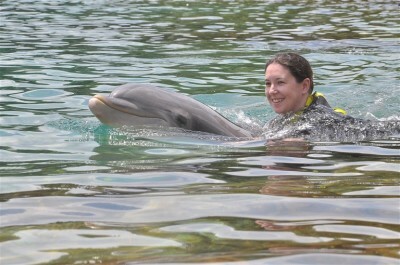 Our dolphin was called Latoya and she was so well-behaved in the water for us. We all took turns to feed her, and she showed off with some tricks and graceful swimming. Each of us had our photo taken with Latoya after we had given her a kiss. There was also a group photo for each family before the swim began. At this point we had the choice of a deep or shallow swim. Miss A decided to complete a shallow swim, so I opted for the same. It meant we didn’t have to tread water whilst we waited and we were assured it didn’t reflect on the experience at all. It was such a magical experience and one that was over far too quickly. Words just can’t describe quite how amazing it was. I am so glad the opportunity arose for me to realise a dream. How utterly magical! 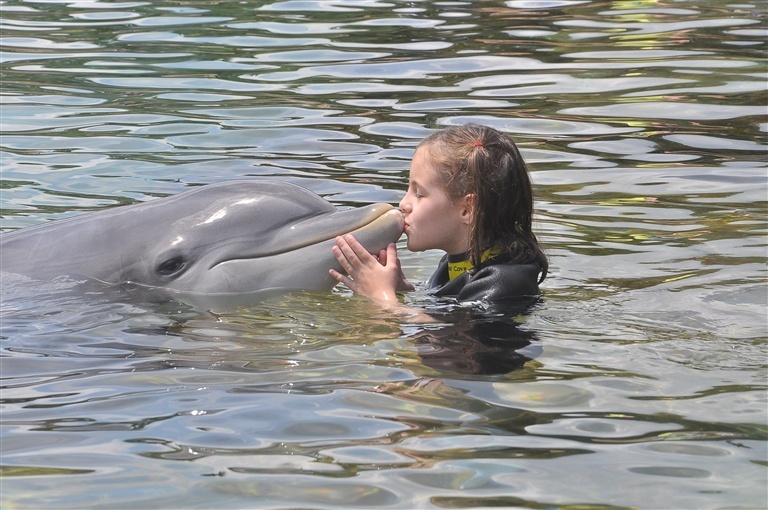 My niece swam with dolphins and said it was a truly unforgettable experience. This looks like an amazing day. What a fantastic experience for you and your family. What an incredible experience! You’re right, it’s a bit steep, but it’s a once-in a lifetime chance, so well worth it, I’m sure. Some beautiful shots in here. Sounds amazing! 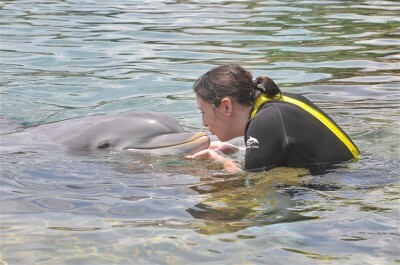 We had booked a dolphin swim when we were on honeymoon and I then found out I was pregnant so I wasn’t allowed to do it. Don’t think we’ll go on this trip to Florida but it’s definitely an experience we need to have at some point. Well done for overcoming your fears to enjoy your dream experience. It does sound expensive when you first say it but when you get all of that, plus the absolutely amazing, once in a lifetime experience of swimming with dolphins it really does sound worth it! Wonderful photos of the most amazing day! Not something for me (not big on being in water) but I know people who have swum with dolphins and said it the best experience of their lives. What an amazing experience, expensive but worth it for a lifetime experience. Sounds amazing! I would love to swim with dolphins too! What an absolutely fantastic experience. I did surprise me that your 7 year old paid adult price but guess the experience is the same. What a great post, so brilliant that you got to complete your dream of swimming with dolphins! Dropping by from Magic Moments. oh wow thats amazing i would love to do it! !